i've had heaps of inquiries about the playmat that mae is seen laying on in so many recent photos (here she is modeling her first pair of jeans and discovering that we actually have a dog) and yes, as leah guessed in the comments of the last post, it is indeed a fleur playmat, based on my flower toy design. the pattern for this playmat will be available in early december in Homespun magazine here in australia. i designed a slightly different version for the magazine, in vintage florals and with more petals. mae's was a bit of a prototype but i love it so much, it's been killing me not to show it in full but not much longer now... i have the rights to the pattern two months after publication date so overseas readers may just be able to get their hands on it early next year. I love the playmat but the jeans are just about the cutest things I've ever seen. the jeans and playmat pale in comparison to your beautiful child! She is gorgeous. Hope she's letting you get a bit more sleep! The playmat is gorgeous, will be looking out for the pattern. Such a gorgeous photo! I'll be looking out for Homespun in December. Gorgeous... can you make it adult size ;) Mae is so adorable, and she's growing so fast. I'll be buying that issue of Homespun for sure - make sure you remind us again when it's published...! It IS fantastic, Leslie! Will look forward to the mag! 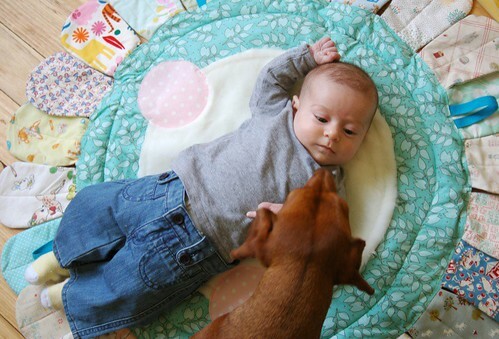 A simply charming play mat, and a darling daughter to boot. So glad I found your little blog! mae is growing before our very eyes, and is such a sweetie! love the mat, love the jeans and congrats on your pattern being published! this rocks... what a cutie... have I congratulated you yet?